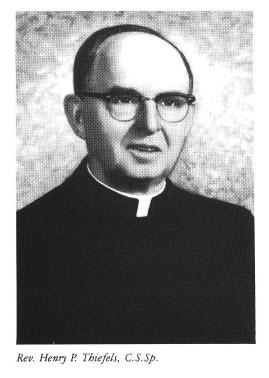 In 1945, Father Knaebal was succeeded by Father Francis Haas as pastor of St. Mary’s. And on February 21, 1946, Pope Pius named Archbishop Mooney to the College of Cardinals. The Second World War was over and the archdiocese was still expanding, especially in the area of parochial schools and in CCD instruction for public school children. New headquarters were established for many communities of Sisters and Brothers. Four new hospitals were built. And Cardinal Mooney became noted for championing the causes of labor and social justice, important concerns in this city and its suburbs. Cardinal Mooney died in Rome on October 25, 1958. He was there to attend the funeral of his friend, Pope Pius XII, and to participate in the election of a successor. The first American appointment by the new pope, John XXIII, was John Francis Dearden when he was transferred to Detroit from his Pittsburgh episcopate and installed on January 29, 1959. Archbishop Dearden immediately began a great movement to help the less fortunate – increasing facilities for the retarded, low-income elderly, and migrant laborers. In the fall of 1960 he established the Archbishop’s Committee on Human Relations, incorporating the work of both priests and lay persons to disseminate the Church’s teaching on interracial relations. And still parishes and educational endeavors multiplied. This was the age of the Second Vatican Council, in which Archbishop Dearden played an important role. He quickly translated its precepts into action throughout the archdiocese, creating a model for sees in other areas of the U.S. Striking an average, we have had 490 children educated here every year for at least 110 years. Based on the present yearly cost of $525 for educating a child, the parish has saved the city something like $26 million. It may be argued that it didn’t cost anything like $525 to educate a child in the 1800’s, but it cost that much in real money, based on wages and salaries of those days. Yet, when I bought the new property for the high school, the city immediately sent me a tax bill for $2,000. Some sad news had to reported in 1962, the first time in 118 years that St. Mary’s Grade School did not open its doors. Although over 56,000 children had been trained there, with the dwindling enrollments of this new era, the chancery had advised its closing and then the Mother General of the School Sisters of Notre Dame decided that her teaching nuns were needed more desperately elsewhere. Father Thiefels bought some adjacent land for $118,000, planning to build a new commercial high school for the endeavor begun so successfully way back in 1924, and the old school was slated for the wrecker’s ball. The first two judges to sit in the auxiliary courtrooms will be William J. Giovan and Joseph E. Maher, both assigned to hear condemnation cases in a building that has barely escaped condemnation itself several times. The last class was taught in the building in late October before the parish held its annual festival there and netted over $8,000. Although workmen had started on preliminary constructions of benches, railings, and platforms in the city carpentry shops prior to October 10, actual remodeling of the school itself was delayed until after the festival. In the last three weeks, workmen have converted the first floor of the school into two small but adequate courtrooms under the direction of architect Eberle M. Smith. The basement and the three upper floors of the building have been blocked off and will stand vacant. The transformation cost the city $14,000 for construction and another $10,500 for furniture… In addition, another $6,500 has been spent on basic libraries for the new judges. E. Burke Montgomery (clerk of Recorder’s Court) said the auxiliary courtrooms will be used until the new Recorder’s Court Building on St. Antonine between Gratiot and Clinton is completed. “But with the shortage of court space in the city, those courtrooms may be used indefinitely”.